Site area: 840,049 sq. 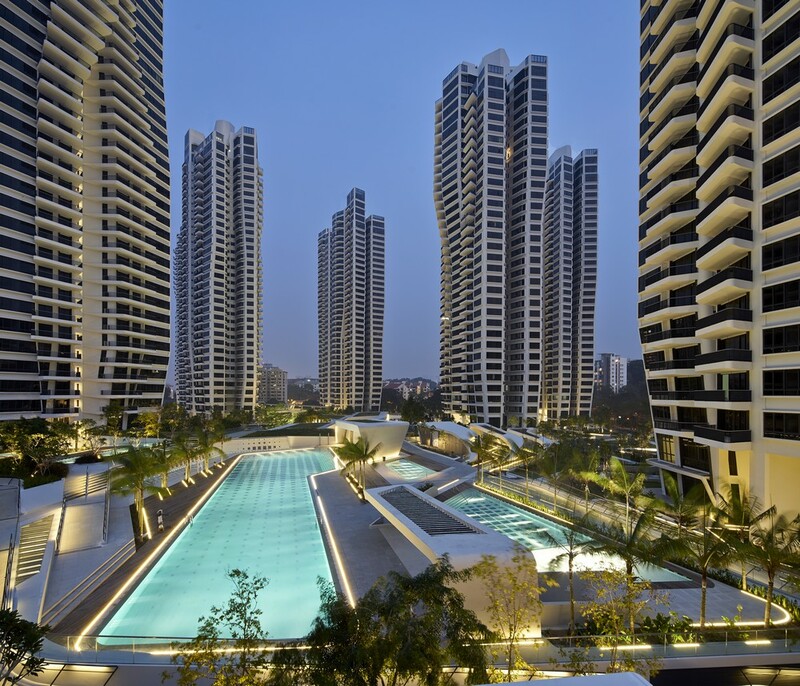 ft.
D`Leedon, Singapore comprises 7 residential towers, 12 semi-detached villas and integrated landscaping with recreation facilities. The towers taper inwards as they reach the ground to optimize public space; a unique petal-shaped layout which allows for windows on three sides of the apartments to give the highest quality of living for all residents with cross-air flows to the living rooms and bedrooms – as well as natural ventilation in all kitchens and bathrooms; varied balcony geometries and the integrated landscaping all contribute to create a unique project defined by its site conditions and context. 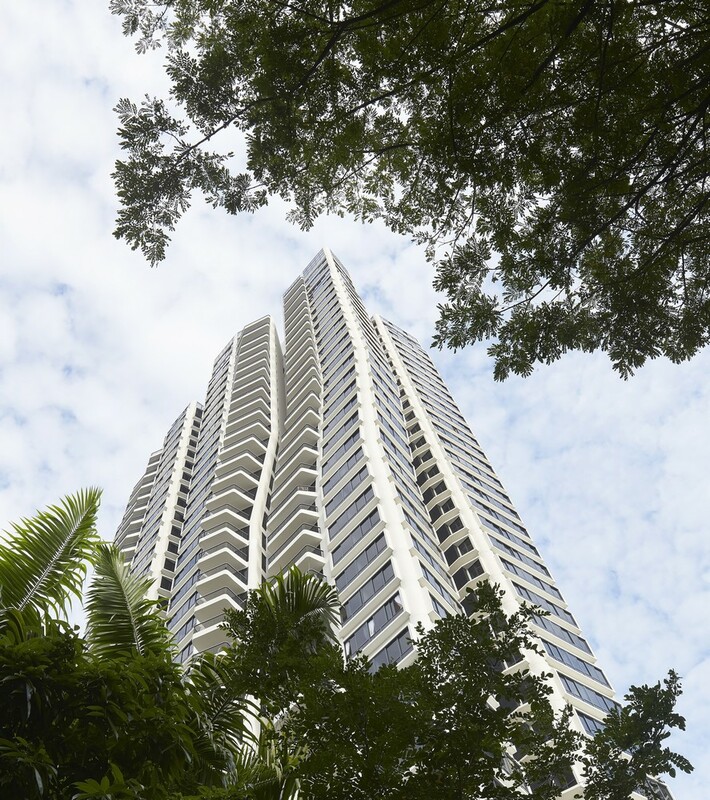 The orientation and placement of the d’Leedon buildings is optimized in response to environmental considerations of managing intense sunlight and to maximize views across Singapore. The landscape and its facilities are organised in bands that respond to the existing alignments of the main axis surrounding the site which. These primary axes are extended within the site to generate a series of lines that define different landscape themes, giving many diverse experiences throughout the whole site. The d’Leedon towers are subdivided into ‘petals’ according to the number of residential units per floor enabling a very large diversity of apartments. The generative floor plan of the petal changes shape along the height of the tower in relation to the different configuration and type of residential units. The changing composition of unit type enables the towers to respond to a series of parameters dictated by site conditions, internal organization and structural optimization. 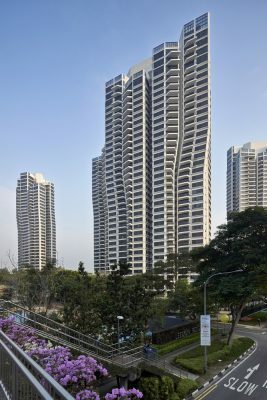 D’Leedon’s design turns the challenges of the site to the advantage for residents, embrace the concept of differentiation and individuality, where single apartments have been customized and specifically designed according to their location and position within the site, as well as the requirements of the residents. 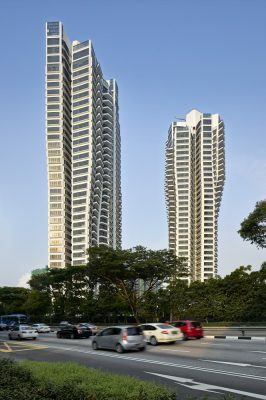 This customization creates a vibrant setting for the residents through high differentiation at different scales of design: from the towers ‘petal’ configuration to the vertical expression of the facades and the articulated sky penthouses and garden units at the base, the design brings together concepts of individuality, differentiation and continuity. D’Leedon is located in the centre of Singapore’s District 10, close to amenities of commercial and civic centres such as Dempsey Hill, Holland Village and Orchard Road as well as popular schools such as Nanyang Primary. 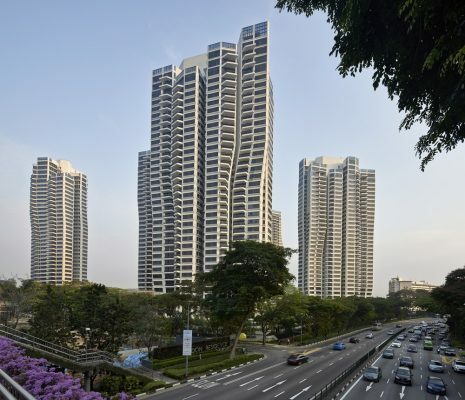 With a covered walkway to Farrer Road MRT Station, the development is well connected to public transport links to Singapore’s CBD and Botanic Gardens and Bukit Timah Nature Reserve. 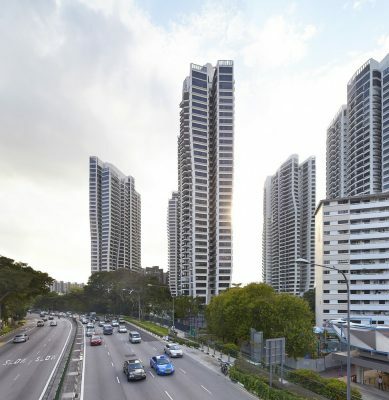 The site presented a number of constraints with to the presence of 2 MRT underground tunnels, the main waterline supply to Singapore from Malaysia and strict setback regulations towards the existing residential buildings at the western edge of the site. The d’Leedon site has been arranged according to existing alignments, the primary axis of Farrer Road and surrounding residential buildings that have all informed a series of lines within the d’Leedon site that connect the development directly with its surrounding neighbourhood. These lines flow through the site and are organized in bands which define the location of each tower for optimum orientation, the lines also establish different features and zones within the landscape. 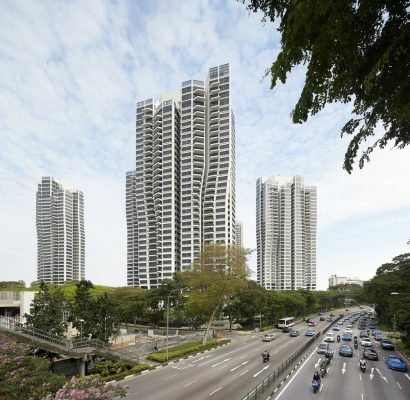 The ground level is visualized as a very green layer, which takes advantage of the extraordinary flora of Singapore and its climate. The site levels are re-organized into a series of terraced plateaus to maximise the areas dedicated to communal amenities. Connectivity and navigation within the site and towards the surrounding city become driving elements for overall site organisation. Car circulation is minimised by routing the part of the main driveway into the basement level, creating a pedestrian-friendly landscape throughout the whole development. Environmental considerations and the location along the equator determined the orientation of the towers along the East-West axis in order to minimize solar gain. Sustainable features are introduced to allow generation and re-use of energy on site and minimize its consumption. The development was awarded Gold+ for its design approach. Zaha Hadid Architects designed d’Leedon as a high-rise residential development that provides highly differentiated apartments layouts according to the specific needs of the residents. 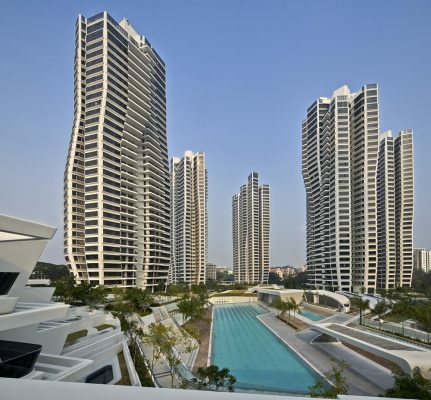 The residential programme accommodates 1715 units, distributed in 7 towers and 12 semi-detached villas, developing a GFA of over 2,2 million sqft. 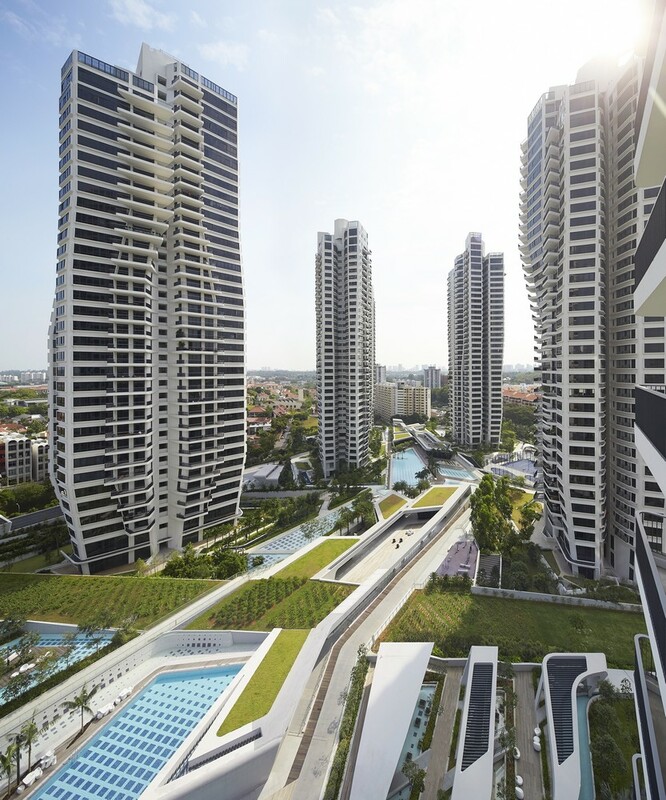 The concentration of residential units in towers with small footprint creates the opportunity for a fantastic public space for the residents and visitors at the ground level. 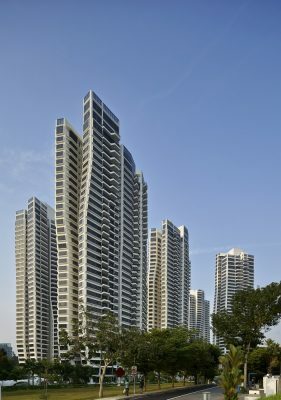 The bulk of the residential program is organized into towers, which grow from private gardens within the site landscape. 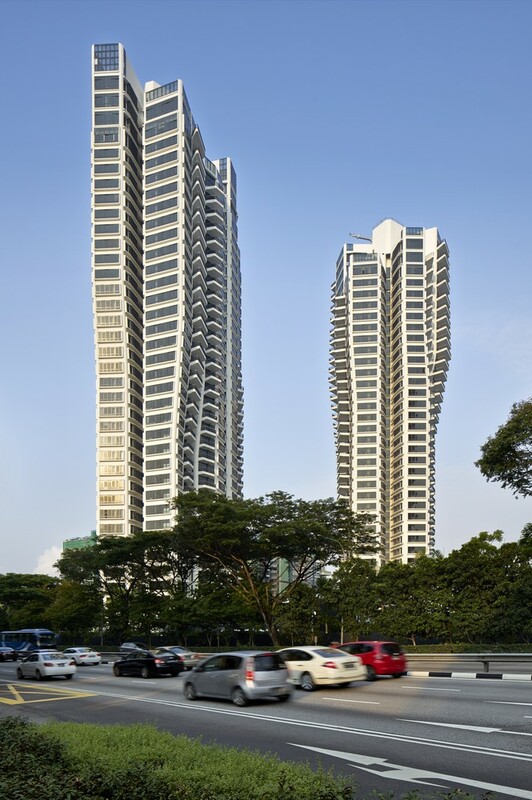 Organic towers stand out in the park, emerging from the green layer as organic forms. The lower floors kink inwards to highlight the point where buildings meet the ground, enabling minimal site coverage and the creation of highly private gardens which are unique given the scale and density of the development. 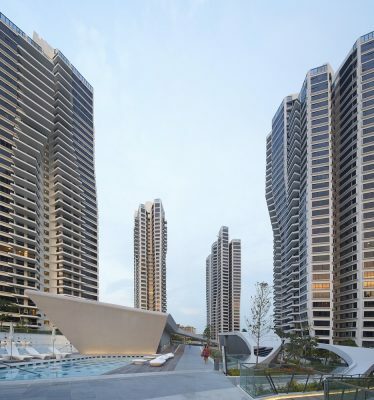 The towers are designed with the concept of a petal which informs the plan layout, with a varying floorplan on different levels providing a range of sizes within the same vertical composition. 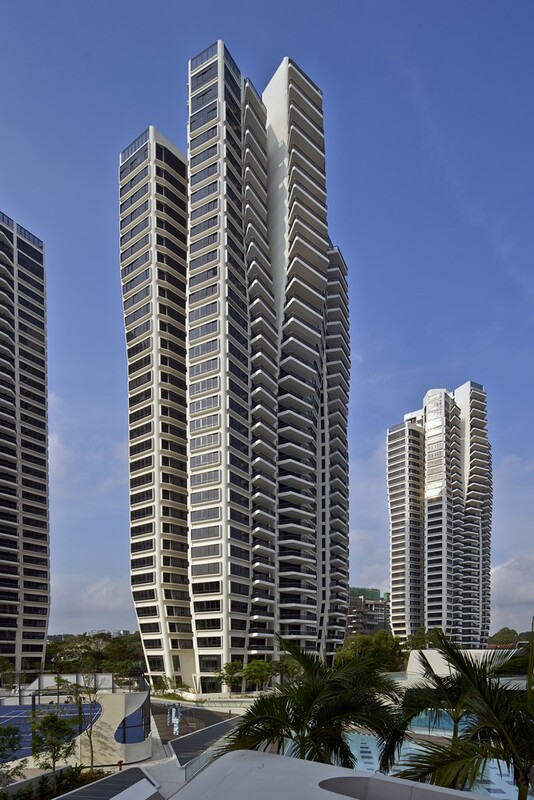 Each petal creates one unit, maximizing façade area for each apartment with a three sided exposure. This provides for over 270 degrees views, cross ventilation and functional openings for back of house areas, with Living rooms exposed to the largest façade, bedrooms around the corners and kitchen and bathroom in the cut areas. The cut are also a design solution to accommodate and minimize the visual impact of external air conditioning units. The petal typology works with the different apartment sizes, namely 4 petal plan for the Tower accommodating the largest units, a 6 petal arrangement for the mid-sized ones, and an 8 petal arrangement for the smallest unit types. There is also a variation of the 6 petal typology where there are 12 units per floor which can be combined, giving residents the possibility to buy a 2 bed and invest on the neighbouring 1 bed, which can be merged together once the family grows. The demand for different unit types and sizes, ranging from 1 bedroom plus study to 4 bedrooms of different dimensions, is catered for by varying the floorplan size on different levels, creating over 340 unique floor plans and a variety of volume modulation in the towers elevations. Balconies of varying size and geometry and bay windows add to the level of definition of the façade. 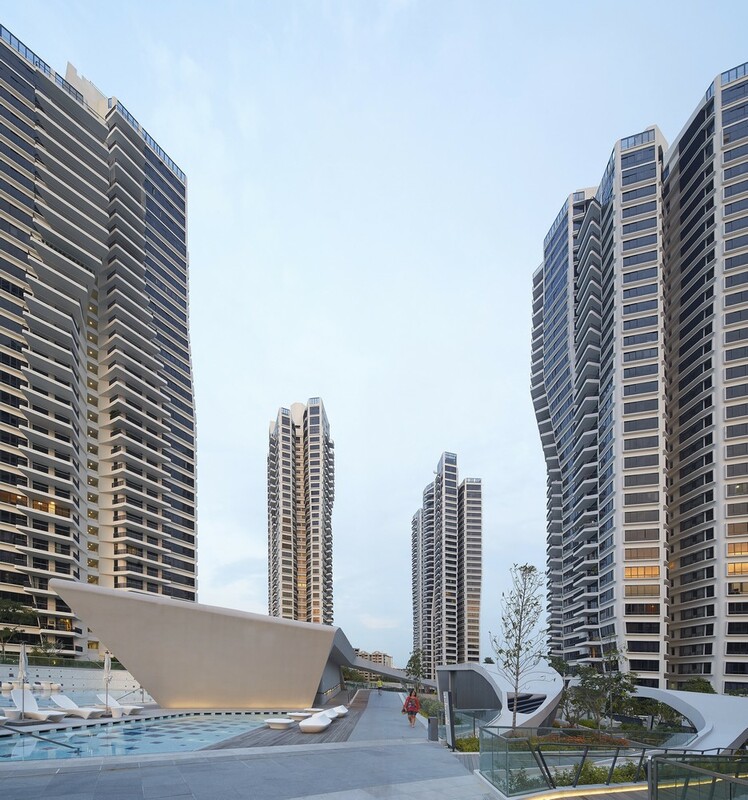 The petals are expressed in three dimensions thanks to vertical cuts which give definition to the buildings’ façades and allow for natural cross ventilation of the flats. 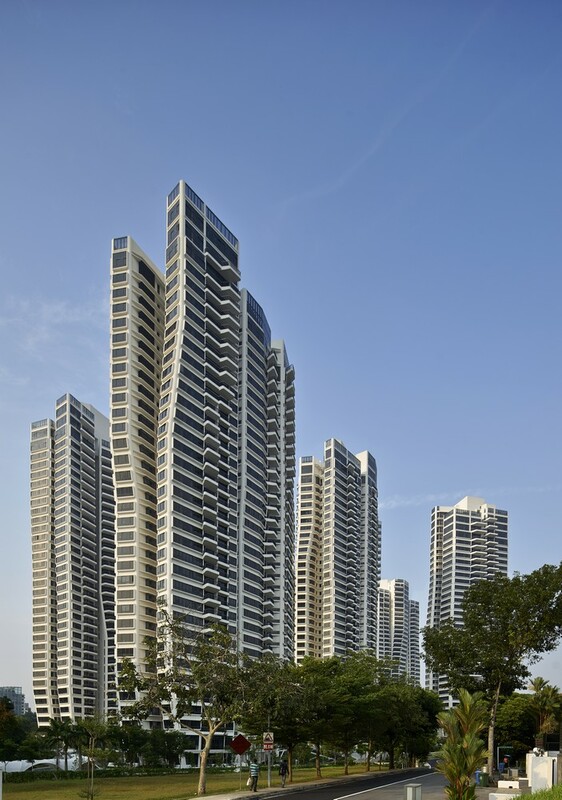 Through rotating the buildings across the site and the careful use of balconies and façade panelling a combination of self-similar towers produce an incredible amount of diversity across the development, giving each residential unit a unique and distinguishable location and appearance, both externally and internally. 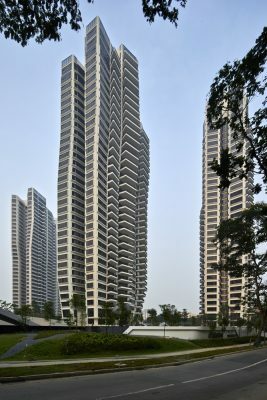 The towers culminate at the top with a series of fingers stepped at different heights, which blend the transition between the architectural fabric and the sky. This distinctive feature of the different petals terminating at different levels, creates fantastic opportunities for penthouses with rooftops gardens and pools directly accessible from the petals below or on the side. 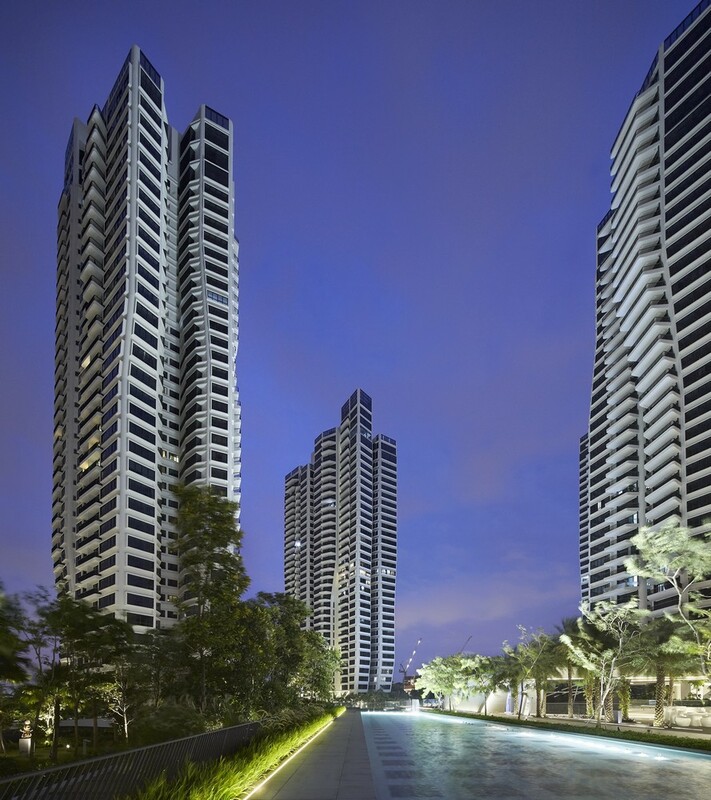 Garden duplex units are provided at the base of the towers, with private car park space underground. With direct access from the garage these special units benefit from higher floor to ceiling height and a private garden at ground floor. 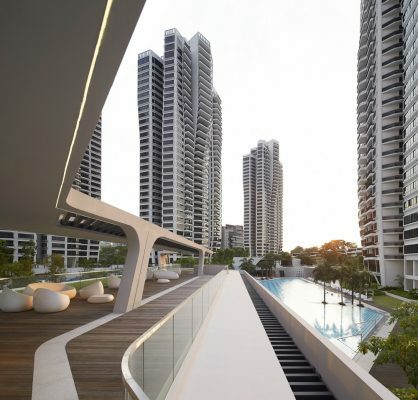 The interior of the residential unit is organized with entry and views in mind. The entrance leads directly to both living and service area, and directly from the living/ dining zone the night area is accessible, the bigger units offer also large balconies in connection with the living room with great views onto the landscape. Throughout the development master bedrooms and junior masters have an en suite bathroom or toilet, with most featuring a fantastic corner aspect and bathtubs facing the façade directly. Floor finishes were developed by the local architect team with primarily use of wood or stone flooring. Balconies are designed to create an additional feature to break the building mass, they vary in size according to the unit typology and create a playful movement by rotating at each floor. The living room doors open directly into the balcony to encourage the experience of outdoor living. The lift lobbies and lifts are fully finished in solid surface material, with bespoke list panelling and buttons. 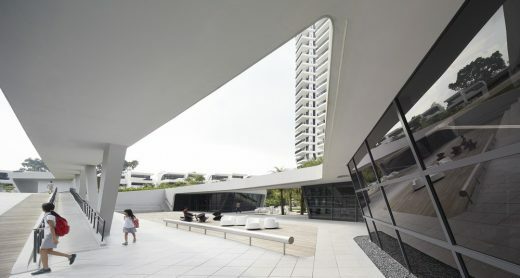 The unique design of the entrance areas picks up some of the setting out lines of the edge of the tower and draws the users towards the entry points. The emerging lines from the landscape have been a primary source in the generation and systematic tests of the design. The lobby extends to the basement with a presence of perforations to the ground plane which solves the dual challenges of providing daylight and quality to the basement and creating an intuitive way finding system towards the source of natural light. towards the core. 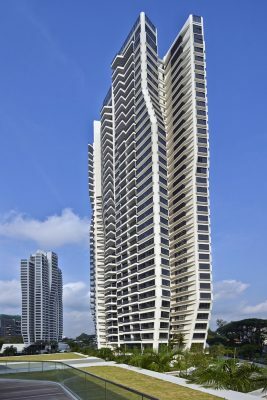 The vertical elements incline outwards to allow for the growing floor plates, with difference of over 7 meters between the base and the top of the column. An innovative concrete shuttering systems has been developed to allow building columns at varying angles. The balconies and the bay windows have been pre-cast on site and craned to position to be bonded to the tower structure as the tower was climbing. 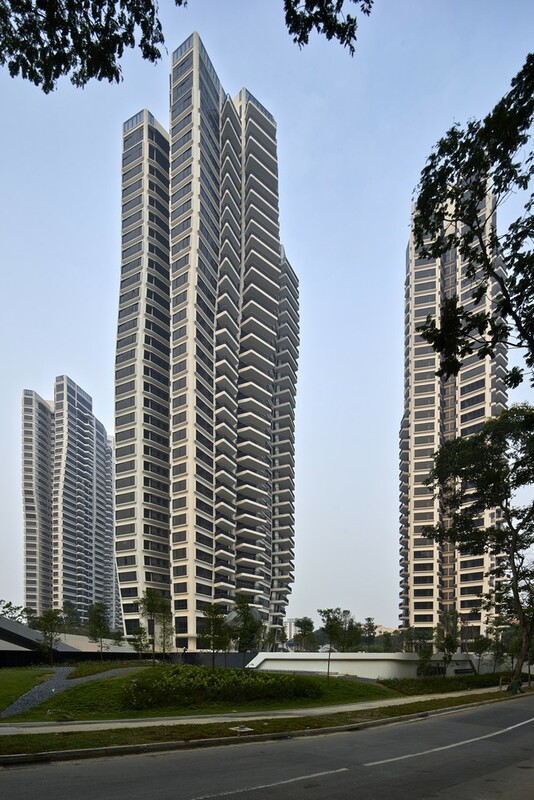 Double curved concrete façade panels were built by prefabricating GRC panels off site, and used as permanent moulds giving a very high level of exterior finish to a complex geometry, those were critical to allow the growth of the central elements of 6 petals towers. The concrete has been simply finished with protective coating and rendered with white paint, leaving the floor structural joints marked. This simple surface treatment highlights the mass while providing the required level of consistency and quality of finishes that a high end residential development requires. Development of new facade systems development was necessary to realize the inclined operable façade panels. Most precedents of complex geometry in tower facades have full size curtain walling and either fixed windows or very small openings. In a residential development were ventilation and comfort of the residents was a key consideration all windows needed to be opened fully. Non-regular trapezoidal window outlines and façades inclined both inwards and outwards required extensive design and product development with the manufacturers. Extensive testing has been carried out to ensure ease of opening and waterproofing for windows inclined up to 15 degrees from the vertical plane, going up to 25 degrees for the villas. Particular attention was given to two of the 6 petals blocks where the bay window surface itself is twisted. 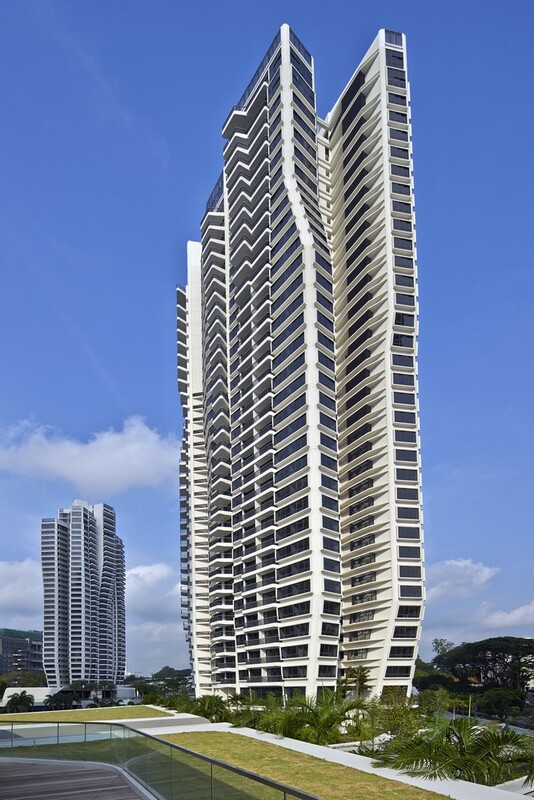 This has been resolved geometrically by staggering blocks of windows to guarantee the same level of functionality of the other units, while generating and interesting façade feature with the central petals projecting out of the building mass at the top of the tower. The glass was selected to have the best performance with the strong sun radiation and the colour of the mullions to match to keep a simple monolithic appearance. Several glass types are used to cater for acoustic, safety and privacy considerations, whilst maintaining a consistent appearance from the outside. 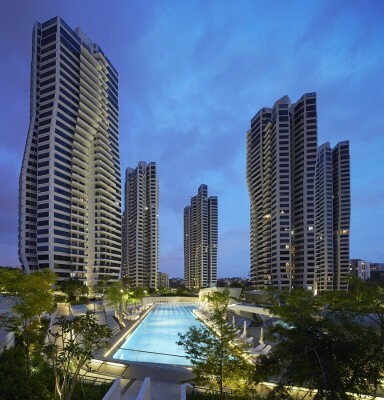 One of the strongest features of d’Leedon, where the benefits of a large scale development and the tower design have been maximized is the landscape, a real park which makes the project resemble a holiday destination resort where people can live year-round in the city centre of Singapore. The site has been divided in bundling bands generated by the tower positions, where each tower lands with an extended petal shape to create the private garden and the access features. Water, lush vegetation, sports surfaces, urban plazas and green fields are the elements that characterise the landscape program. Each of them is dedicated a unique band inspired by the distinct components of mountain ranges: Rock, Forest, Water, Foothills and Meadow. Each band has a different character and ambience, created by using a unique pallet of plant species and paving surfaces. The individuality of the bands is further enhanced through the spatial arrangement, lighting and differing facilities on offer. The effect of this striking landscape arrangement gives residents and visitors an unforgettable visual and spatial experience as they pass through the site. 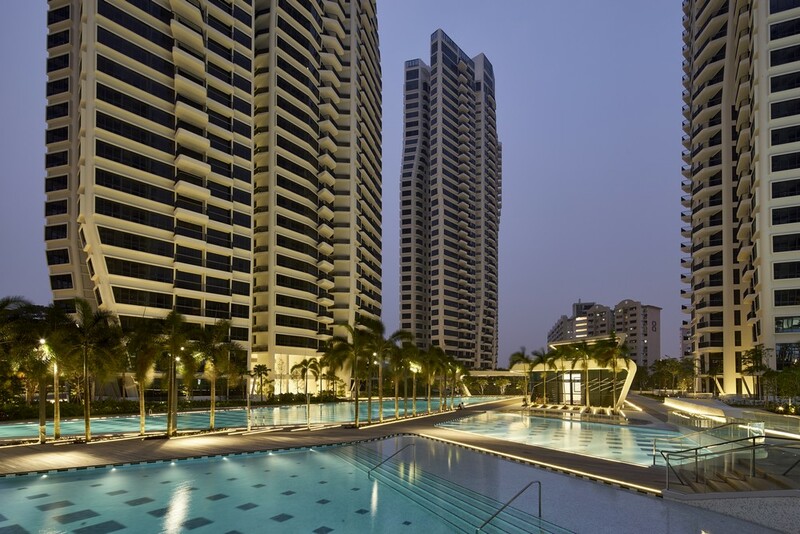 Forming the central axis of the site this zone is a hive of activity and energy, this manifests itself in the form of numerous water features, pools (50m and 75m), Jacuzzis and children’s wet play pool. The water used in many forms, from still and reflective, to cascades and fountains. Water is also used to create several unique features such as waterfalls to negotiate the change in levels and natural ponds. Planting is provided to give dappled shade to the pools and consists of species that are naturally found by water. Strung along the water band are two clubhouses with multiple facilities, spa, a large gymnasium, retail areas, and restaurants. 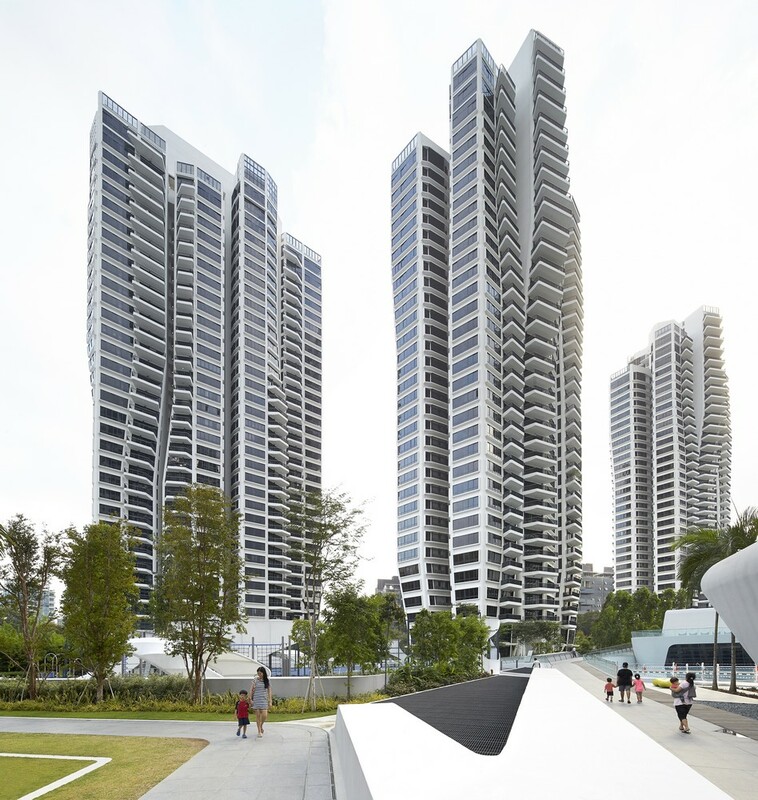 The design and distribution of the structures housing the facilities recalls the tower geometries, based on petal patterns, in a coherent composition. The facilities volumes emerge from the landscape as a continuum surface, with no distinction between buildings and green areas. The roof becomes floor and the landscape become building, as part of an integrated system. Each facility petals is defined with a specific program, yet unified and integrated under a same roof articulation. Communal activities, both indoor and outdoor are offered in great number to cater for all interests and age groups in the various bands. Culminating at the peak of the site are three party houses designed as a single sculpture, each with their own Jacuzzi or dip pool. The design for the landscape facilities is finished with a very high quality GRC over a steel structure, and large glazed areas facing the water. 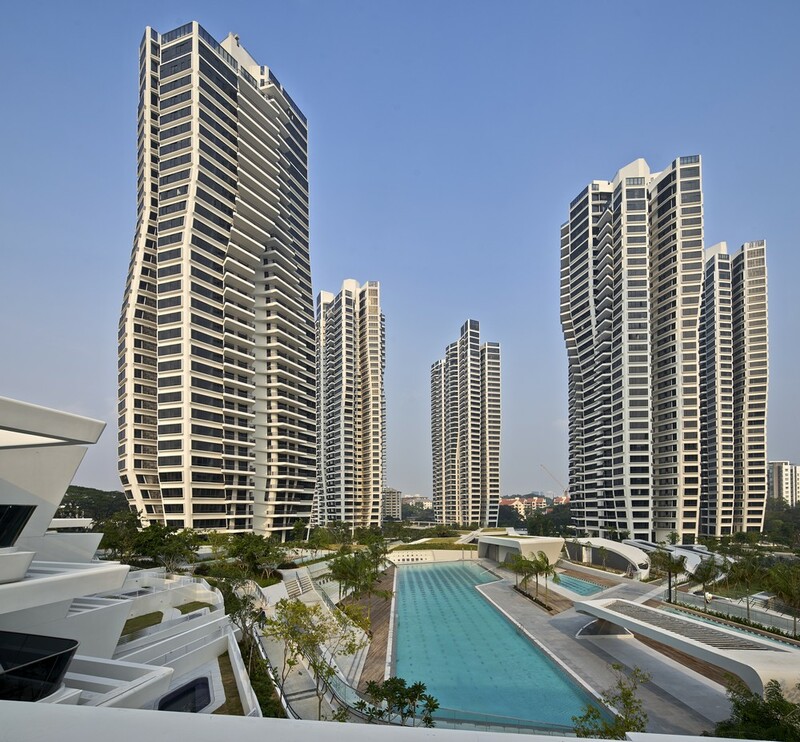 The rest of the landscape is kept mainly green to emphasize the towers growing from a park, with a series of sport and activity areas scattered and integrated within the overall site design. The main features are 3 full size tennis courts, a multi-purpose court, barbeque areas and a uniquely designed bamboo labyrinth. dynamic design d’Leedon, with its whirl of pedestrian pathways, but also pockets of quiet green and breathing spaces, infinitely fascinate the visitors and residents alike, aiming at enhancing the quality of living. Lighting plays a key role in the development as particular attention is given to the experience of the site at night, the time when residents switch off and get back home, a calm and luxurious light path drives them safely to their destination. All light sources have been concealed to allow the architecture and its surfaces to take centre place instead of the light fittings, with extensive use of linear lighting to emphasize the lines and the geometries. construction. The design team was spread over several time zones exploiting the possibilities of sharing software and platforms, BIM models, conference call and workshops. 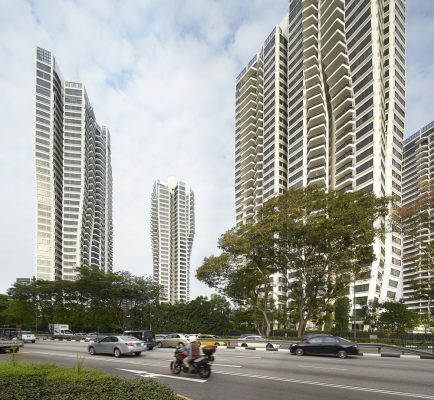 With d’Leedon Zaha Hadid Architects explored new possibilities in large scale residential design, rethinking each element of the design and bringing together concepts of individuality, differentiation and continuity.